Eri Martin weaves a pack basket in his apartment in Unity on Jan. 31, after returning from class at Unity College. Martin sells his handmade pack baskets under the business name Mountain Adventure Baskets. Cradling the half-finished pack basket in his arms, Eri Martin wove a flexible strip of wood around its circumference. Softened with water, the thin pieces of wood yielded to his manipulations, slowly taking the shape of a tall vessel, rounded on one side and slightly curved outward at the rim. A senior at Unity College, Martin took a class on how to build traditional pack baskets about three years ago, and since then he’s developed the skill, creating more and more complex and high-quality baskets. He started weaving, he explained, and he just couldn’t stop. Now in his final semester of earning a bachelor’s degree in adventure-based environmental education, Martin is balancing his studies with his new business, Mountain Adventure Baskets. 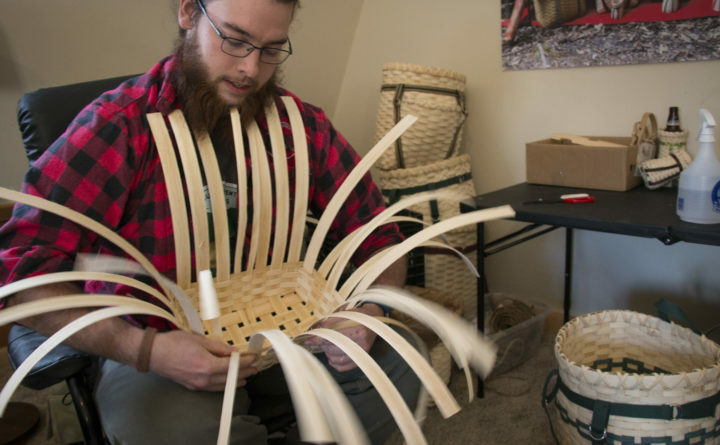 He hopes to expand the small enterprise and work his way toward opening a school in Maine for learning outdoor and primitive skills — such as basket making. Pack baskets were originally crafted by the native tribes of the Northeast to carry items while traveling, foraging, hunting and fishing. Pack baskets are designed to be carried on your back, an important feature when portaging [carrying a canoe] around rapids or from one body of water to another, Neptune pointed out. Just as the birchbark canoe was adopted by early European fur traders and settlers, so was the pack basket, Neptune said. The woven packs became a necessity for guides and outdoorsmen throughout Maine and in many other areas of the Northeast, such as the Adirondacks, where Dutch settlers also had a hand in the development of pack basketmaking. “There was a time when there wasn’t a self-respecting woodsman in the Northeast that didn’t have a pack basket,” said Bill Mackowski, a pack basketmaker and fur trapper in Milford who has done extensive research on the history and traditional techniques and materials of pack baskets. Traditionally, the baskets were made from strips of wood pounded from the trunks of brown ash trees. These splints are then woven in specific patterns to construct a basket that is extremely durable, beautiful and useful for carrying a wide variety of items. Nowadays, pack baskets are still in demand, said Mackowski, who receives basket orders from all over the country. Nevertheless, fewer and fewer people are making pack baskets, he said. 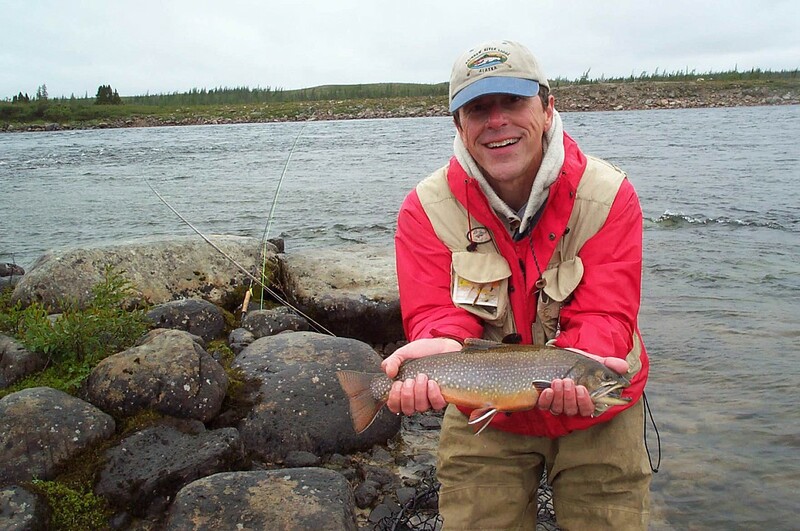 Martin took a Unity College class in pack basket making from Jessica Steele, director of The Outdoor Adventure Center, and quickly developed a love for the craft. He was already familiar with pack baskets though — he’d used them while teaching primitive skills to Boy Scouts at Camp William Hinds in Raymond, where his father has worked as a ranger for many years. Since then, he’s honed his craft through trial and error. Originally, he wove his baskets using ash, the traditional material. However, he’s found that ash is hard to come by, even if you go outside, find a tree, cut it down and pound it into splints yourself. Neptune said there are certain people in her community who are skilled at finding and harvesting good ash trees for their basketmakers. Even so, in the future, finding good ash for basket making will likely be a problem because of the emerald ash borer, an insect that kills ash trees and was first discovered in Maine last May, in the northern town of Madawaska. Martin searched for a substitute for ash and ended up with rattan, climbing palms that are farmed for their flexible, durable wood that readily accepts paints and stains, making it ideal for furniture making. He orders his supply from Asia, from a company that sends it in big coils. He then cuts and soaks the strips of rattan in water to make it flexible before weaving. In some ways, Martin prefers rattan to ash. It’s more flexible, and can be dyed. It’s also less expensive, which means he can sell his baskets at a competitive price. Currently, the retail price for his full-size pack baskets ranges from $95 to $150, depending on the style. 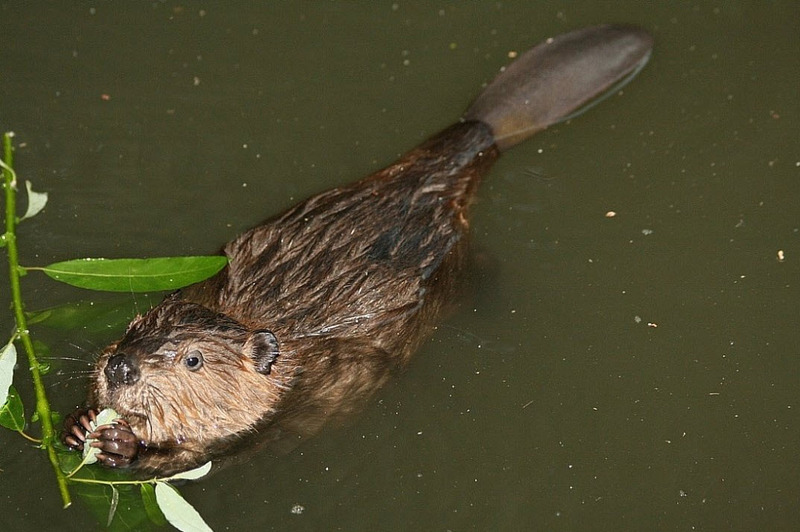 Martin sells a variety of pack basket styles, including an especially tall basket that’s good for storing ice fishing traps, a tapered basket that’s ideal for foraging, and a basket with a front pouch that he calls “the opossum” after Maine’s only marsupial. He’s also working on designing a series of pack baskets to honor Maine outdoor legends, starting with Cornelia “Fly Rod” Crosby, Maine’s first registered Maine guide. For the straps on his baskets, he uses cotton webbing that’s soft and durable, which he stitches together on a sewing machine. And on the bottom of his baskets are wooden feet that he carves himself, screwed securely into a wooden base. Martin isn’t the first to craft pack baskets out of alternative materials. Wane Loring of the Penobscot Nation weaves traditional pack baskets out of ash, as well as more modern designs out of synthetic materials, which he sells through his business Loring Outdoors. Meanwhile, L.L.Bean’s pack baskets are made out of maple. About a year ago, Martin started selling his pack baskets at craft shows and online. Since then, he’s sold about 70 full-sized pack baskets of various styles, as well as many of his popular $15 tiny pack baskets that serve well as drink koozies. The heater kicked in Martin’s apartment on a particularly cold January afternoon, blowing warm air around the living room as he patiently worked wooden strips into his classic pack basket model. As he slowly turned the latticework on his lap, weaving the sides up taller and taller, a strip of rattan occasionally disappeared in his red beard, only to emerge a moment later. When he reached the top of the basket, he sandwiched a rope of seagrass between two thick strips of rattan and wove it together, twice, forming a criss-cross pattern all the way around the rim. Some modern-day pack basketmakers simply staple the rim together to save time, but Martin is adamant about using old weaving techniques as much as possible. He also works without the use of any frame, which some pack basket makers use as a template for weaving around, then remove when the basket is complete.